And pull it off they did. 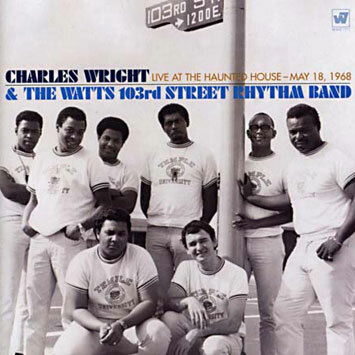 When Charles Wright And The Watts 103rd Street Rhythm Band took the stage at the storied-and long-gone-Hollywood nightclub the Haunted House on a spring night in 1968 to record a live album, they were already a regularly-scheduled house favorite at the venue. Mixed from the original four-track tapes, Rhino Handmade's 2-CD live recording LIVE AT THE HAUNTED HOUSE captures the well-oiled band in top form, pumping out funk and soul for the masses pounding the dancefloor and making the scene. It also represents the group at a watershed moment, as they began to evolve from a dance band into a creative force that eventually defined a signature soul style known as the "L.A. sound". While their classic song "Express Yourself" wouldn't come for another two years, Wright and company do that and more on this electrifying set. The line-up featured on LIVE AT THE HAUNTED HOUSE is the third iteration of The Watts 103rd Street Rhythm Band: singer/guitarist Charles Wright, bassist Melvin Dunlap, drummer James Gadson, guitarist Al McKay, saxophonists John Rayford and Bill Cannon, trumpeter Gabriel Flemings and trombonist Ray Jackson (trumpeter Joe Banks was absent from this gig). Leading up to this, the group had gained notoriety recording and playing live with Bill Cosby, and had released one album, Hot Heat & Sweet Groove, for Warner Bros Records. A portion of what's heard here would subsequently be edited for their second album, 1968's Together. In its entirety, the show is a riveting portrait of the pioneering group's funk, soul and muscle. One highlight is key-the gig marked the moment when one of their signature hits, "Do Your Thing," emerged. As Oliver Wang writes in his liner notes: "After grooving on 'Funky Broadway,' the band laid down a simple rhythm line and began to build in power; Wright saw an opportunity emerge: 'I looked down at the dance floor, and everybody was dancing, and that's how I coined the phrase 'Everybody get on the floor, do your thing now.' The moment was spontaneous and could have happened on any other night, but that night the machines were running. When Wright took the recordings home and listened to that passage, he heard more than just a rhythmic interlude-there was a song buried there. 'We recorded on Saturday night,' he said. 'On Monday I went to the studio and I cut it out and took it home.' After some editing, 'Do Your Thing' was born". Experience it on Rhino Handmade's LIVE AT THE HAUNTED HOUSE, available exclusively from Rhinohandmade.com in a numbered, limited edition of 5,000 copies at $29.98.